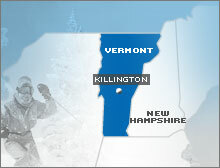 KILLINGTON, Vermont (AP) -- Voting with a thunderous "aye," residents endorsed a plan Tuesday for this ski resort town to secede from Vermont and become a part of New Hampshire instead. Ultimately, the vote could prove to be only symbolic. State lawmakers in New Hampshire and Vermont will have the final say. And Vermont legislators said secession will probably be voted down. Town officials said about two-thirds of the 200 to 300 people who attended the town meeting supported secession. The main source of discontent is Vermont's new system of financing education, adopted in 1997 on orders from the state Supreme Court. It dramatically increased property taxes in wealthy communities like Killington. Secession activists say Killington's restaurants, inns and other businesses send $20 million a year to Montpelier in sales, room and meal taxes, while the state returns just $1 million in municipal and education aid to the town of roughly 1,000 residents. "The state is treating us like a cash-cow," said David Lewis, town manager. Town officials will now draft a petition to present to New Hampshire Gov. Craig Benson and the state's Legislature. Lewis said town officials want New Hampshire's approval before approaching Vermont's lawmakers. Copyright 2004 The Associated Press. All rights reserved. This material may not be published, broadcast, rewritten, or redistributed.